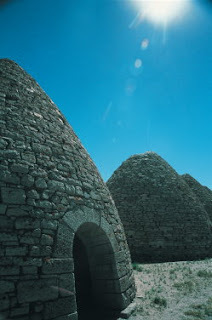 Scattered across Nevada are a handful of 19th century charcoal ovens that resemble nothing less than giant stone beehives. These stone or brick domes were once used to convert wood, often pinon pine, into charcoal that could be used in mining smelters. Best known of the state’s charcoal kilns are the Ward Charcoal Ovens, 12 miles south of Ely. Here, you can find six 30-foot-high domes built in 1876 to produce charcoal for the smelters at the nearby mining camp of Ward. Valuable ore was discovered in the foothills of Ward Mountain in 1872. Within three years, Ward had grown into the largest town in eastern Nevada, with a population of more than 1,000. By 1877, Ward had boomed to 2,000 people and a city hall was under construction. The flush times, however, were short lived. Mining began to decline and within three years the town had only 250 residents. Mining continued on and off for the next few decades—in fact, the area was reopened most recently in the 1980s and is currently being mined. The charcoal ovens were built a few miles from the town. Using native rock, the builders constructed these unique cones that are about 30-feet high and 27-feet around at the base. When filled, each could contain some 35 cords of pinion pine stacked in layers. The dome-shape allowed for the wood to be kindled easily and the heat was controlled by opening and closing small vents at the base of the ovens. The massive ovens were abandoned during the 1880s. 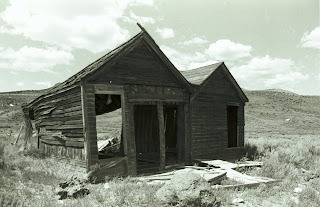 Over the next century, the intriguing stone buildings were used for a variety of purposes, including as stables and emergency lodging for wandering sheepherders and cowboys. Local legend says that one oven even served as a bridal suite. According to the story, a gambler decided the oven was a perfect place for a wedding night. He had the walls whitewashed, hung curtains and installed appropriate sleeping accommodations. The gambler and his fiance, however, apparently quarreled before the marriage -- perhaps over having to spend a night in a drafty old stone charcoal oven -- and cancelled the wedding. Eventually, the ovens were acquired by the Nevada Division of State Parks, which oversees the site. Today, you can find the ovens, a handful of undeveloped campsites and beautiful surroundings. While the Ward kilns are among the most accessible of the state's charcoal ovens to reach, there are a handful of others scattered around the state. Another set of relatively accessible ovens can be found 14 miles north of Pioche. There, at a place called Bristol Well, are the remains of three stone kilns, originally built in 1880. The Bristol Well kilns were constructed of local shale and sandstone, which gives them a more rough appearance than those at Ward. Silver and lead ore was discovered near Bristol Well in 1872. The camp developed slowly; by 1880, a five-stamp mill and smelter had been constructed, along with the three ovens. It wasn't until 1890 that Bristol Well had a post office and could boast 400 residents. By the mid-1890s, however, the town was in decline, and had almost disappeared completely by 1905. Today, only the kilns remain. Full or partial remains of kilns that can be found tucked away in remote corners of the state, include: a stone oven west of Eureka, overlooking the Diamond Valley; a couple of ovens near Panaca Summit, off State Route 319; and several that are near the mining town of Tybo, east of Tonopah. Crickets chirping in the tall grass that surrounds the weathered remains of a half-dozen brick and wooden buildings are the only permanent residents in the old Eastern Nevada mining town of Hamilton. Once the largest city in White Pine County with more than 10,000 inhabitants, the ghost town of Hamilton is now little more than a memory. The once thriving mining town is now home to only a handful of decaying buildings in the shadow of White Pine Mountain, adjacent to the mining district called, appropriately, Treasure Hill. Hamilton is located 12 miles south of Highway 50 at a point about 35 miles west of Ely. To reach the townsite, follow the signs from the highway on a well-maintained dirt road. Two of Hamilton's ruins at least provide some idea of the significance of the town. The tallest is the two-story J.B. Withington Hotel, erected in 1869. Studying the ruins, you can imagine how it once looked, an impressive structure with several chimneys. Old photographs—some from as recently as the 1940s—show it was once a large edifice made of native sandstone with arched doors and windows. Over the years, however, the outer walls began to decay (much of it collapsed during an earthquake in the late 1950s) so that today all that remains is a mound of sandstone and red brick. A few hundred yards away you can find the arched brick front wall of what was once the Wells Fargo building. This leaning slab of molded red clay blocks somehow held together by scraps of wood and mortar likewise hints at a surprising quality of workmanship. Exploring the scattered mounds of sagebrush and rubble, you can find foundations, stone walls and wooden studs of other buildings. They are spread across a fairly large area, providing an idea of the size of this town, which was also the original seat of White Pine County. Additionally, the town has a fairly large cemetery, located to the north, which gives you a sense of the kind of place Hamilton was by telling you who once lived there. Surrounding the remains, visitors will find the evidence of more recent mining operations, including rusted trailers on a hillside above the townsite, large metal buildings, pieces of equipment and the recognizable shallow pool of an abandoned leeching pond. Hamilton's mineral resources were discovered in late 1867. In May 1868, a townsite was laid out at the base of Treasure Hill and named Cave City because of the presence of many caves in the area. Within a short time, rich silver discoveries in the region sparked one of the most intense mining rushes in the state's history—it was called "White Pine Fever" in some newspapers—and thousands of people began pouring into the area. Additionally, as the town began to develop, it was incorporated and its name was changed to honor W.H. Hamilton, one of the town's founders. By the spring of 1869, an estimated 10,000 people were living in Hamilton. For the next few years, Hamilton boomed as the center of the White Pine Mining District, which also included the nearby communities of Shermantown, Eberhardt and Treasure City. The town had several stage lines, more than 100 saloons, 60 general stores, its own water company, a newspaper and dozens of other businesses. Despite the fact a fine brick courthouse was constructed in Hamilton in 1870, the boom proved short-lived. The silver turned out to be generously spread across the surface but shallow. By 1871, the town began a rapid decline. Two years later, a local merchant attempted to torch his business for insurance money and caused more than a half-million-dollars in damages to the business district. By 1875, the town had been unincorporated and its population had shrunk to less than 500. Another fire, in 1885, destroyed the courthouse and nearly the rest of the town. In 1887, the county seat was moved to Ely—but there were few people left to care. In 1916, famed naturalist and writer John Muir passed through Hamilton and later wrote "a few years ago, the population of Hamilton is said to have been nearly eight thousand . . . Hamilton has now about one hundred inhabitants, most of whom are merely waiting in dreary inaction for something to turn up." Surprisingly, the post office found enough business to stay open until 1931. Unfortunately, Hamilton's accessibility contributed to its demise. White Pine County residents tell of ghost town explorers and bottle hunters who nearly looted it out of existence during the 1950s. A good source of information about Hamilton is Shawn Hall’s “Romancing Nevada’s Past, Ghost Towns and Historic Sites of Eureka, Lander and White Pine Counties,” available online and in local bookstores. One of the most accessible spots in Southern Nevada’s magnificent Red Rock Canyon is Calico Basin, located at the national conservation area’s eastern edge, near the ever-expanding metropolis of Las Vegas. The basin is unique in that it’s one of the few places in Red Rock with privately owned homes. In fact, visitors drive through the neighborhood of about a dozen small ranches in order to reach the parking lot and trailhead. Adjacent to the parking area is a small cluster of picnic tables, fire grills, trashcans and restrooms. But the real treat can be found by strolling onto a wooden boardwalk that is accessed from the parking lot. Rebuilt in 2005, the developed trail gradually leads up the side of a hill to Red Springs. Along the way, several interpretive displays describe the local flora and fauna as well as the history of the area. At the top, there are actually three natural springs, Red Spring, Calico Spring and Ash Spring, which flow into a small saltgrass meadow in the center of the basin. Interestingly, the flow from Red Springs comes from inside a small cave in the sandstone walls above the meadow. With rock walls protecting it on three sides, the meadow is, according to the Bureau of Land Management’s information, sheltered and moist—making it a perfect habitat for a variety of birds, animals and plants. For example, the BLM notes that a handful of different kinds of trees can be found in the basin including cottonwood, ash, shrub live oak and honey mesquite. The boardwalk encircles the springs and meadow, keeping visitors from trampling on the vegetation. Near the end of the trail, if you look closely, you can find the foundations of a ranch house that once stood in the meadow. The basin also offers great views of the nearby Calico Hills. 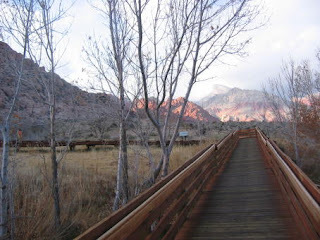 Hiking trails lead north from Calico Basin to the hills and other parts of the conservation area. Since Red Rock Canyon encompasses 195,610 acres, there are plenty of other places to see in the recreational area. Without a doubt, it is one of Southern Nevada’s most scenic places with its dramatic banded limestone and sandstone cliffs and mountains. The unique rock formations here were formed thousands of years ago when the earth was literally turned upside down. Shifting landmasses caused the older strata of rock (limestone and shale) to actually become piled atop the younger deposits of red sandstone. Formations exposed in the Red Rock area record more than 500 million years of geologic history. A good place to get an overview of the entire conservation area is at the Red Rock Visitors Center, operated by the BLM. Inside are excellent displays describing the geology, history, plant and animal life, archaeology and recreational opportunities available in the area. To reach Calico Basin from downtown Las Vegas, head west on Charleston Boulevard for about 15 miles. About 1.5 miles before you reach the scenic road that leads to the Red Rock Visitors Center, you’ll spot the turnoff for Calico Basin. Follow the signs for about a mile through homes to reach the parking lot. For more information about Red Rock Canyon National Conservation Area, contact the Bureau of Land Management, HCR 33, Box 5500, Las Vegas, NV 89124, 702-363-1921. For more than quarter century, travelers heading west on Interstate 80 knew they had reached the city of Sparks when they passed a big gravel pit. Between 1968 and 1995, the Helms gravel pit, as it was called, provided millions of tons of rock for area road and construction projects. In 1987, however, the pit, which had grown to more than 100 feet deep, was closed when Sparks officials discovered petroleum chemicals and solvents seeping into the hole. They traced the contamination to a massive spill at an oil tank farm located about a mile west. As a result, the pit was designated a Toxic Superfund site and a major cleanup effort was undertaken. The city of Sparks took possession of the site in 1996, after tests showed that the groundwater in the pit was free of petrochemicals and other dangerous substances. At that time, city officials proudly announced plans to convert the former gravel pit into a park and recreational pond using millions of dollars in fees and fines paid by those responsible for the contamination. The original idea was to fill the pit with water to a depth of approximately 30 feet, which, it was estimated, might take several years. Then along came Mother Nature. 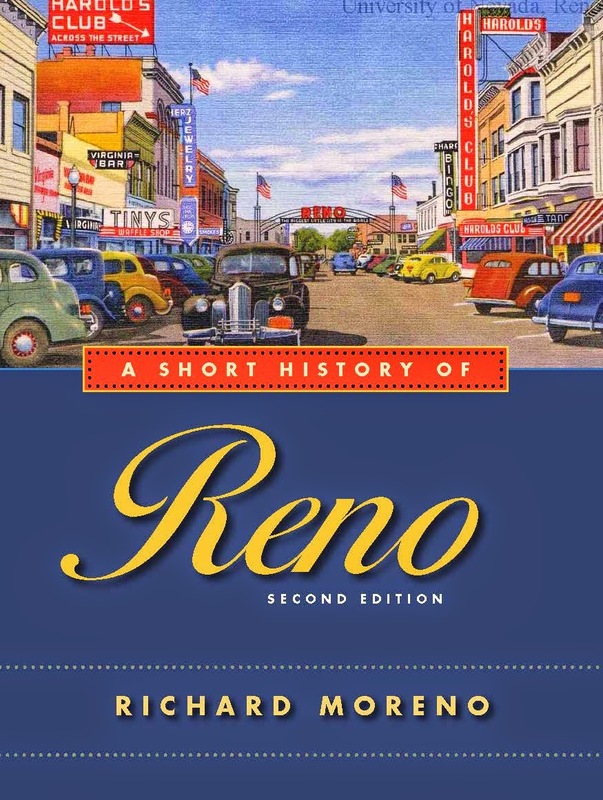 In January 1997, the Reno-Sparks area experienced the highest recorded flooding in its history. The Truckee River overflowed its banks and an estimated one billion gallons of water poured into the hole. Overnight, the Sparks gravel pit had become Nevada’s newest body of water. The unexpected lake, now called the Sparks Marina, is 100 feet deep and covers about 77 acres. Ironically, in order to keep the water at a constant, desirable level, every day the city pumps approximately 2.3 million gallons from the lake into the Truckee River. While some sport fish have been introduced into the lake, including rainbow, cutthroat and brown trout, it may include other species that accidentally spilled into it during the 1997 flooding. In the past decade, the city has developed the area around the lake, installing two public beaches, picnic areas, sand volleyball courts, bicycle and hiking trails and boat ramps. When the weather is nice, the marina grounds quickly fill with people. 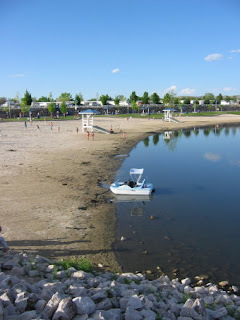 The lake has also become a popular spot for casual sailing and kayaking as well as the site of several recent professional wakeboarding competitions. The latter is a surface water sport that involves riding atop a lightweight wakeboard (it resembles a small surfboard) that is pulled by a speedboat. At the marina’s east edge, the city allowed development of a small condominium complex, where the homeowners have access to the lake via a small canal. Additionally, the city approved a 1.35 million square foot retail, resort and dining complex, called the Legends at Sparks Marina, also on the east side of the marina. Scheduled to open later this year, the first phase of the project will include a 250,000-square-foot Scheels sporting goods store, a dinosaur-themed restaurant, T. Rex, created by the founders of the Rainforest Café chain, the Saddle Ranch Chop House and Cantina Corona. Additionally, the city has announced that Olympia Gaming will build a $500 million casino, resort and spa as part of the development. The project will eventually include 1,000 hotel rooms, convention space and a lakefront amphitheater. Not too bad for a former gravel pit.